The HL-3070CW is a fast, compact printer that produces brilliant color output at up to 17ppm in both color and black. It is ideal for printing high-impact, color brochures, presentations and other important business documents, quickly and affordably. In addition, its stylish, space-saving design helps save valuable workspace and complements virtually any environment. The HL-3070CW also provides built-in wireless 802.11b/g and Ethernet interfaces for sharing on your network, a generous paper input capacity, PCL6 and BR-Script3 emulations for greater compatibility, and 64MB standard memory for faster processing of important print jobs. Additionally, it includes a USB Direct Interface to print from your USB flash memory drive or PictBridge-enabled digital camera. Flexible connectivity. Featuring built-in wireless 802.11b/g and Ethernet network interfaces, you can easily share this printer with everyone on your wired or wireless network. The printer also offers Hi-Speed USB 2.0 interface. Fast color printing. With a print speed up to 17ppm in both color and black, you can now have brilliant color output faster than ever before. Brilliant color output. 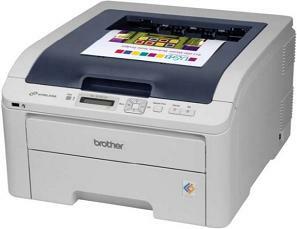 Produce high-quality output at up to 600 x 2400 dpi resolution using Brother's Digital LED print technology. Large paper capacity. An adjustable 250-sheet capacity paper tray handles up to legal-size paper and a manual feed slot is for printing envelopes and letterhead. USB Direct Interface. Print PDF and JPEG files directly from your USB flash memory drive without connecting to your PC. Connect directly to your PictBridge-enabled digital camera to print pictures from the camera, without first downloading to your PC. Straight-Through Paper Path. A convenient manual feed slot and rear paper exit provide a straight-through paper path for printing envelopes, thicker media and custom paper sizes. Easy to replace toner cartridges. A top-loading design makes it easy to install and replace toner cartridges.